Today is an exciting day! OK, not birthday exciting, but pretty cool nonetheless. Today – Friday – is the start of London Fashion Week. Last week the fash-pack headed en masse to the Big Apple for the New York catwalk collections, and this week it’s the turn of our capital city to host the world’s leading stylists, glossy magazine editors, supermodels and all the ultra-glam hangers-on that make up planet fashion. And that means all manner of exciting catwalk shows, chic cocktail parties and cool happenings will all be going on right on my doorstep. I love, love, love fashion, and it’s always thrilling seeing what the designers have dreamed up for us to wear each season. However, I have to admit, even a dedicated follower of fashion like myself can get a bit muddled up when showtime comes around. You see, fashionistas work to a totally different diary than the rest of the planet. Just to get things clear: in the real world we are just about to start shopping for our autumn wardrobes, but in the fashion world, autumn is long past – the autumn/winter 2012 collections were shown on the catwalks way back in February. Right now, on planet fashion, everyone has moved on to next season, which means on the runways this week we’ll be seeing clothes to be worn in spring/summer 2013. Fashion is basically topsy-turvy – it’s all bikinis in the winter and snow-boots in summer. But working out what season we’re in is the least of my fashion worries. A bigger problem I have, come fashion-show time, is more personal (but I know it’s an issue for women the world over, all the same). The thing is, I love checking out the catwalk shows and getting a glimpse of the new season’s trends. Occasionally I’m even lucky enough to attend runway shows and red-carpet fashion parties myself to watch all the action first hand. But each time I gaze up at those long-legged, slim-hipped models gliding up and down the runway, I am reminded that I just don’t have a “high fashion” body. There’s also what I call the “bonkers fashion” problem. I know that catwalk shows are all about getting attention for designers, but many high-fashion looks are so extreme, so dramatic – so bonkers – that even in a fashion-obsessed place like Chelsea, they’re just too OTT to wear. Fashion-world look = crazy-tall and crazy-slim, crazy outfit. Binky = regular height, regular curves and regular taste in clothing. Which means that while I may dream of slipping into cutting-edge catwalk looks, the reality is that high fashion wasn’t designed with my figure, or my life, in mind. Luckily, I have a solution to my fashion-week problems! 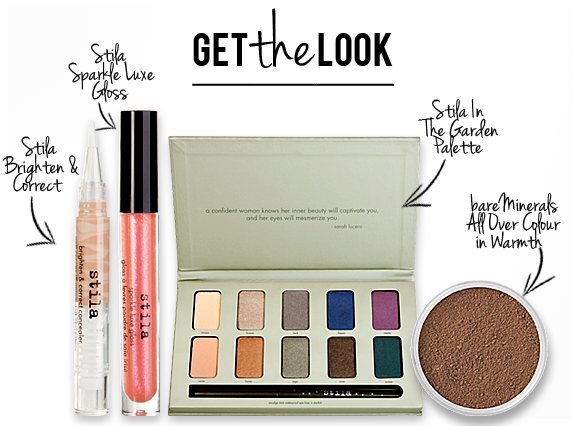 While many clothing trends may be ruled out for me, I can easily experiment with all the new-season beauty trends. The world’s leading hair stylists and make-up artists are called in to craft brand new looks for the catwalk shows and fashion-week parties, and with a bit of thought, these high-impact catwalk looks can be adapted to work in the real world. Now, while catwalk beauty can often be quite extreme – a bit “fashion bonkers” like the clothes, it’s a great way of picking up new ideas. I absolutely loved the dramatic “peacock” eye make-up at the Roberto Cavalli autumn/winter 2012 show. The models’ eyes were made up in jewel-bright shades of emerald, sapphire and amethyst (that’s green, blue and purple to non-fashion peeps out there!). It was stunning. Cassie suggested taking that catwalk look as my inspiration and adapting it to create a party face that works for regular girls like me. We discovered the perfect selection of eye make-up colours in Stila’s In The Garden Palette, which includes all the shades used in the Roberto Cavalli catwalk show. However, rather than copying the look, Cassie explained how to blend the strong shades of purple, blue, green and gold together to create a wearable party look. As you can see from the photos, the finished make-up is still bold and colourful without being “fashion bonkers”! If you want a step-by-step guide on how to get the total look (using Dior Airflash Foundation, Stila Brighten & Correct Concealer, Stila In The Garden Eyeshadow Palette, Stila Sparkle Luxe Gloss Colour in Fairy Dust and bareMinerals All Over Face Colour in Warmth) check out my vlog on MSN, where you can watch make-up magic taking place on film! Right, I’m off to a totes fashionable party. Hope your week is as much fun as mine. PS – You can learn to be a professional make-up artist at cassielomasmakeupacademy.co.uk – Cassie is an amazing teacher! 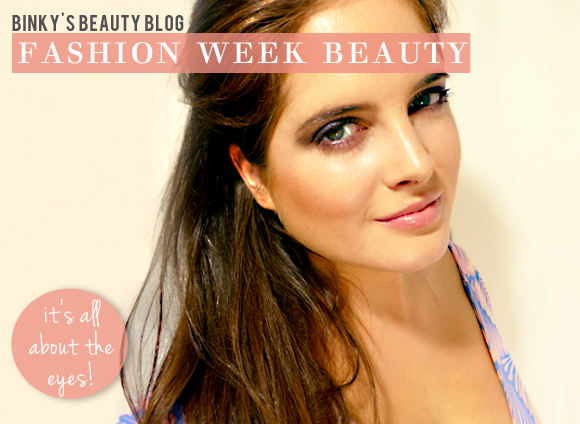 This entry was posted on Friday, September 14th, 2012 at 1:20 pm and is filed under Binky's Beauty Blog #BBB, Make-up. You can follow any responses to this entry through the RSS 2.0 feed. You can skip to the end and leave a response. Pinging is currently not allowed.